Great location, great convention facilities, superb staff, clean rooms. I would stay here again anytime. Drinks are a bit pricey. Great location, convenient to all of Disney and Sea World. Wonderful restaurants, pool area and view of Disney. Staff is very friendly, service oriented and professional. We very much enjoyed our stay and would book a vacation there again. Beautiful pool area and very nice restaurants. I can't think of anything... oh, one restaurant, the sports bar was not the same friendly, professional service we received throughout the hotel. Excellent staff, great rooms, excellent golfing. I highly recommend. Excellent rooms, nice facilities, friendly staff! Needs free shuttles to Disney theme parks. 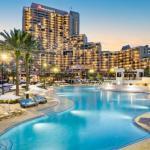 The 2,000-room Orlando World Center Marriott Resort and Convention Center is located two miles from the Walt Disney World theme parks and provides luxury accommodation for the upmarket business and pleasure traveler. The resort is set among 200 acres of landscaped grounds and has 73 meeting rooms for business or social functions. The largest, the Cypress Ballroom, can accommodate 13,000 guests. Area landmarks and attractions include Downtown Disney, Universal Studios, Gatorland, Sea World, Wet n Wild water park, the Islands of Adventure amusement park, the Florida Citrus Bowl, Amway Arena, home of the Orlando Magic basketball team and shopping at the Florida Mall, Prime Outlet Shopping Mall and Fashion Square Mall. All the rooms and 110 suites have a work desk with high-speed Internet access, tea and coffee making facilities, Internet browser television with cable news and movie channels, pay-per-view movies, telephone with voicemail and speakerphone, in-room safe, AM/FM clock radio, pullout sofa bed, iron and ironing board and a hairdryer. This resort has six swimming pools, an 18-hole golf course, whirlpools, tennis courts, a full-service spa and fitness centers. There are six restaurants plus a lobby lounge, poolside bar and a Starbucks Coffee. Room service is available from 6am until midnight. The 24-hour front desk has safe deposit boxes and information and tickets for the Orlando attractions and events. Other amenities include a business center, coin-operated laundry, valet dry-cleaning services, an ATM, games room, gift shop, newsstand, limousine service, daily housekeeping and ice and vending machines. This is an enormous resort  the largest Marriott in the world  and most guests thought it was a wonderful place to stay with all the facilities, top-notch service and superb accommodation. There were some who felt it was too big, and complained about the high prices, particularly for parking. Despite this most clients said they would return for conferences or a vacation and had no problem in recommending this enormous property to others. Parking: Yes, there is parking. Self-parking costs $12.78 per day. Valet-parking costs $21.30 per day.